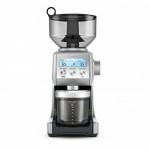 Baratza Preciso is another grinder from Baratza. From the outside it looks very similar the Baratza Virtuoso. But it is slightly higher quality, which is understandable given the higher price point. It is slightly heavier, produces very little static, is not too loud and grinds fast. Despite fast grinding, it does not heat the beans substantially. It has many different grind settings – 40 just different grind adjustments and then divides each one of those settings into 11 distinct steps. 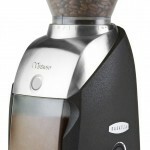 This will enable you to be able to find perfect grind setting that suits you best. The Baratza Preciso is equipped with 40 mm conical burrs grind coffee at 1.5 to 2.4 g/sec. depending on the setting. They are good for espresso, drip, manual brewing methods and Press Pot. 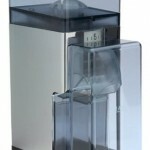 The burr set is manufactured in Lichtenstein, which assures their quality. This conical burr set grinds at almost twice the speed of the Virtuoso conical burrs (while spinning at the same RPMs), but also produces much less fines than the burr inside the Virtuoso line. The burrs have a precision mounting system to ensure a stable platform for accurate grinding. A powerful, high torque DC motor effortlessly drives the burrs. This motor turns slowly resulting in cool, quiet operation and permits long grinding duty-cycles. In 2012, Baratza introduced the second generation Gearbox (GB 2.0). With GB 2.0, Baratza has significantly increased the strength and durability of the drive transmission while decreasing noise. Baratza did a lot of work to reduce the static created by the grinder. They decreased static a lot, but it still exists if you grind for more than half a minute. Note that you will also get more static when grinding finer. Still, there is a considerable improvement in static created. 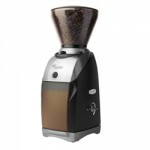 The grinder retains very little coffee inside and burrs look relatively clean even after repeated use. The grinding inside is happening at relatively high speed (1.5 to 2.4 grams per second is faster than most competing products) so there is a certain amount of heat that is produced in the grounds. However customers do not seem to be irritated by that; every grinder produces some heat anyway and at this grinder heat is not noticable. The grinder has a great grinding consistency. The bean hopper is made of a smoked brown colored plastic. The capacity is 8 ounces (227 grams). It can be easily opened and removed. There is also a grounds bin with capacity of 5 ounces (142 grams). The Preciso has a sixty-second timer with segmented graphics at the side of the grinder, for easily repeatable grind times. In front of the grinder there is also a “pulse” button for grinding on demand. Furthermore, with 40 settings you can quickly adjust from fine for espresso to coarse for French Press. Micro Adjust: A secondary micro adjust lever further divides each of the 40 Macro positions into 11 distinct steps. These steps (10 microns each) enable you to precisely dial in the grind for the perfect shot. 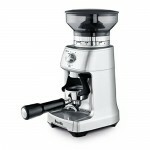 The Preciso’s grind range is 200 to 1170 microns. Because of the micro adjust option on the grinder, you also get a nearly unprecedented level of control over fine tuning an espresso grind. This is important for achieving the best possible espresso shots. The grinder is made of plastic. The bean hopper is made of a smoked brown colored plastic so it blocks light a bit. Finally burrs are made of steel. 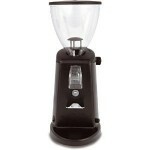 The grinder isn’t particularly noisy, but you can reduce noise quite a bit just by leaving the lid on the top hopper. You can carry on a conversation though, albeit at slightly raised voices. Burrs are easily removable with no tools, making cleaning easy. Also the grinder is not too messy. Consumers are in general happy with the product. They like that is easy to clean, provides consistent grind and with customers service. They complain about poor durability. The grinder will cost you around 300$. The price, as usual for Amazon tends to fluctuate around that price point. Baratza Preciso is a high quality grinder, which will provide you with fast, consistent grind with little static. For coffee enchiladas there are a lot of different grinding adjustments which can make your grind perfect. Grind speed, particle size, fines (or lack thereof), grinding range, and the amount of fine tuning you can apply to the grind will definitely surprise you in a positive way with this grinder.